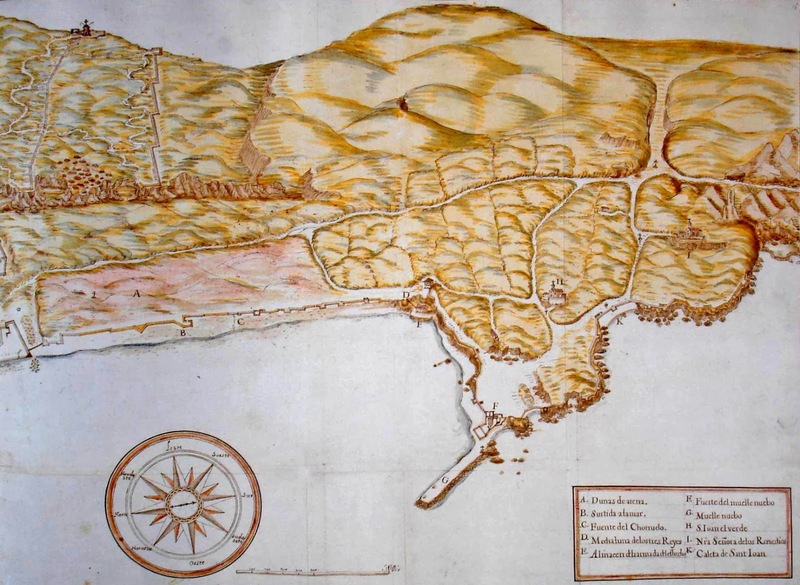 14th century Gibraltar is not an easy epoch for an amateur historian. The relationship that existed at the time between Marinid and Nasrid Moors was byzantine in its complexity, as was the almost incomprehensible medieval rivalries between the various Spanish kings and noblemen. At the start of the century, Gibraltar still found itself under Moorish rule. The glorious days of Abd al Mu'min and his Medinat-al Fath ( see LINK ) were long gone and one could be forgiven for thinking of Gibraltar as a forgotten backwater. In 1309 Ferdinand IV of Castile finally managed to wrench the place from the Moors ( see LINK ) He found it in a poor state and carried out a program of running repairs on its dilapidated defences. 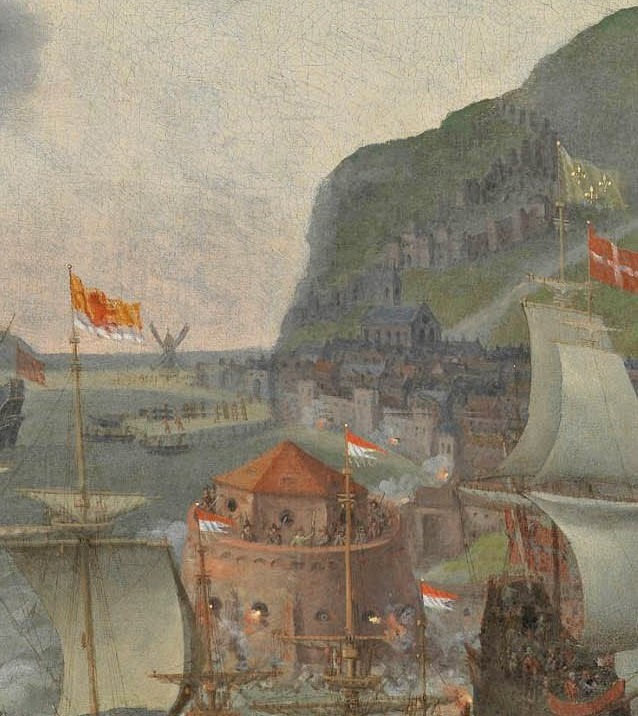 Perhaps his most well known innovation was the construction of an atarazana or dockyard in an area which would one day be known to the Spaniards as la Barcina and later to the British as the Grand Casemates. Christian claims on the Rock would prove short lived. In fact they lasted less than a quarter of a century. In 1333 it was back in Moorish hands. Although the plan to recover the Rock was initiated by Muhammad IV - the real leading light was the Marinid ruler of Morocco, Abu Al'Hasan 'Ali ibn 'Othman whose name seems to have been spelt as either 'Hassan' or Hasan' depending on the fancy of the writer and who I will refer to from now on as as Abu-l-hasan. At this period, Vasco Perez de Meira, a Galician knight, was Governor; but he, more intent on laying the foundation of large entailed estates, than of the care of so important a charge, diverted to the purchase of large properties near Xerez . . the means granted by the King for the maintenance of the garrison . 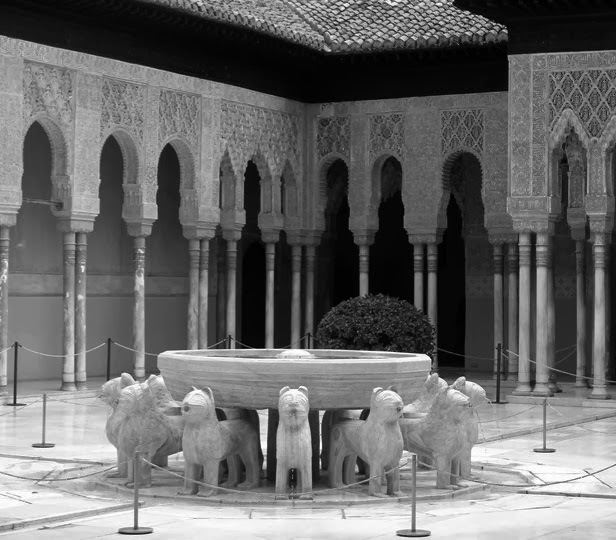 . . His covetousness led him even to sell the stores he possessed to the Moors, who gladly purchased with the premeditated intention of attacking when scarcity should prevail . .
Not surprisingly Muhammad's proposal was met with warm approval by the newly installed Sultan of Fez. Abu-l-hasan, it must be stressed, was not just the most powerful man in Muslim circles but was also a survivor of the first water. Under him the Marinid Maghreb would eventually extend over an area that was larger than that of the Almohad Caliphate which had preceded him. He survived a revolt of his troops, the loss of many of his supporters and a nasty shipwreck. He even managed to avoid the usual fratricidal consequences when his son, Abu Inan Faris seized power in Fez. He failed in his attempt to regain his throne in 1350 but managed to seek refuge in the High Atlas mountains and died in exile 4. Admittedly, some historians do suggest he was killed in 1351 in the mountains of Hentetah. 5 There are always exceptions to the rule. Although it offers no further clues as to his character, Abu-l-hasan's mother was Abyssinian and he himself is reputed to have had a dark complexion. He was known as the 'Black Sultan' of Morocco. But whoever he was it is almost certain that his description as the greatest of the Marinid Sultans is almost certainly correct. It was soon over and Gibraltar was once more a Moorish stronghold. The Christians - in the shape of Alfonso XI of Castile - tried to recapture the place but a series of ill-conceived and poorly executed attempts meant that the assault soon petered out into an ineffective siege - the fourth suffered by Gibraltar during its long military history and the only one that can claim the dubious honour of having its besiegers being besieged themselves. Praise to God Alone. 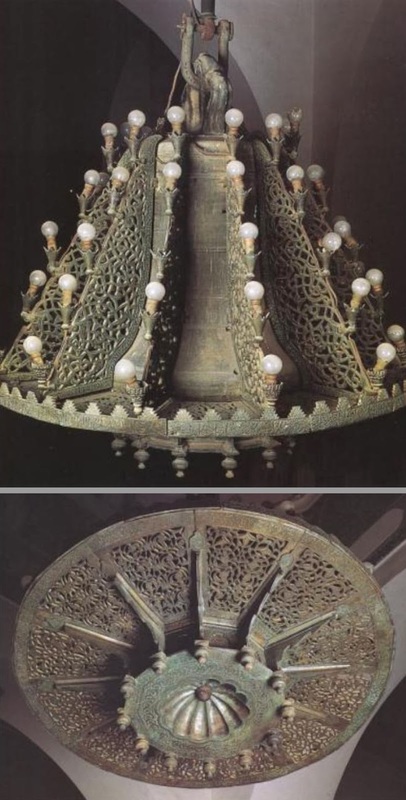 This holy bell was ordered emplaced by the lord of the muslims, defender of the faith Abu-al-Hasan 'Ali . . . This is the bell found at Jabal al-fath (Gibraltar) God keep it, conquered by the help of God and with His aid by the Muslims Abu-al-Hasan . . . The complete fixture still hangs under the third cupola from the anza where it was placed all those years ago. The great ten hundredweight bell from the main church in Gibraltar converted into a lamp and now hanging in the Mosque of al-Quarawiyin. It was now time for Abu l-Hasan to start modernising and extending Gibraltar's defences as well as building new civilian buildings and institutions. Like their Almohad predecessors, Gibraltar's new Marinids owners intended to use it as a springboard to attack or counter-attack the Christians. For this he needed not just a fortified town and it attendant military garrison, but a resident population to keep the place supplied with provisions and other home comforts. Among his very firsts strategic decisions was the order to construct a system of 'ribats' These were essentially forts or towers which could be used to defend the borders between Moors and Christians. Many were also meant to serve as watchtowers to give warning of any enemy attack. 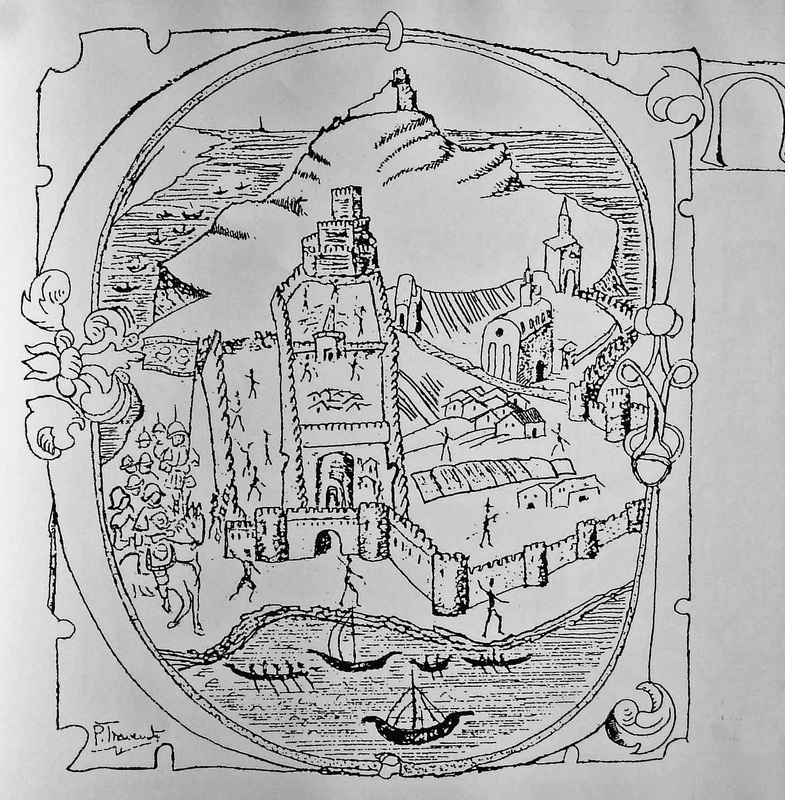 It is hard to say whether any of the many towers still standing on the shores of the Bay of Gibraltar and elsewhere in the Campo area were built on the ruins of these Moorish forts but their existence is confirmed by Ibn Marzuq. It is hard not to speculate that the well-known 'Hacho' watchtower which stood for centuries on the top of the Rock might not have been part of the system of ribats ordered by Abu-l-hasan. Money seemed to have been no object as he then ordered the repairs to the many buildings damaged and destroyed by their own and by Alfonso's siege engines. 13a He began with perhaps the most important building of the lot - the castle at the highest point of the Qasabah in Gibraltar. As always there was a preoccupation with the possibility of an enemy invading from the south, climbing up the rock and taking a position along the area above the Castle leaving the town vulnerable to enemy bombardment - as indeed had been the case, not just by themselves during the 3rd siege but also in the 1st when Alonso Perez de Guzman ( see LINK ) and his celebrated tower caused havoc to the defending Moors. In place of the smaller and irreparably damaged Almohad tower built by Abd al Mu'min, Abu l-hasan constructed an enormous keep - the strongest Moorish fortress in the whole of al-Andalus perhaps even in the rest of Spain. Arabic text refers to the tower as either al-Qahirah al-Uzma or al-Ma'tharah al-Uzma. 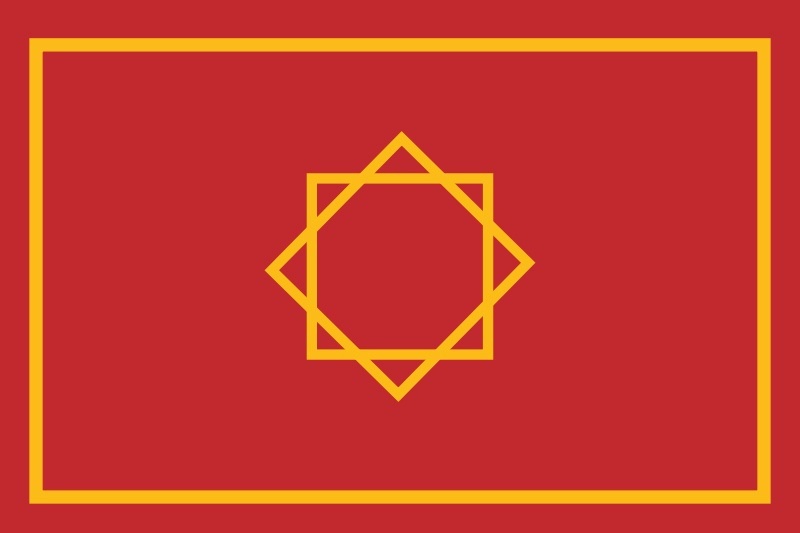 The Spaniards once called it the Calahorra and it is possible that this is a corruption of al-Qal'ah al-hurrah which means 'the Independent Citadel'. It seems that this name was given to towers or fortresses that were exceptionally large and powerful and dominated their immediate surroundings. Today it is often referred to as the Tower of Homage 14 which - it seems to me - should refer to the older tower which was indeed the place in which the Moorish overlords paid their dues to Abd al-Mu'min, the man who built it. The lower sections of the walled Qasabah would contain living quarters, administrative buildings, cisterns and gardens. Below it lay a residential district with mosques - which would later be converted into churches by the Spaniards - and other important buildings. It was enclosed within its own walls with several gateways, the most important being the Gate of Granada, ( see LINK ) the main entrance to the town from the north and from Spain. The entire district would later be known to the Spaniards as Villa Vieja. Just below Villa Vieja lay the shipyard. Moorish sources suggest that Abu l-hasan constructed a brand new dockyard - dar as-Sina'ah - in 1333. That this arsenal was in fact a new one seems rather doubtful. The evidence is that Ferdinand IV ordered one to be built just after the first Christian occupation in 1309. One can only surmise that this was a bit of Moorish hyperbole and that in fact all he did was improve on what was already there. Elsewhere there is mention of the construction of new magazines and the erection of new defensive walls and towers. In the area to the south of Villa Vieja and the dockyard - or Barcina as it came to be known in the next century, there was an area called the at-Turba al-Hambra or the Red Mound - later known as la Turba - he build several non-military buildings including a 'Cathedral Mosque' which was undoubtedly the origins of the present day Catholic Cathedral of St Mary the Crowned. Unidos a los puertos del monte demás del de la Ciudad hay otro segurísimo y muy capaz en la Torre del Tuerto aunque otros dicen que se ha de decir la Torre del Puerto porque es guarda de este puerto, y a lo que parece no debió sé hacerse esta torre para otro efecto sino para este y para guardar jarcias de armadas. In 1340 Abu Malik was killed when Alfonso XI of Castile and Alfonso IV of Portugal destroyed the armies of the Nasrid ruler Abu al-hasan and the Marinid King of Granada Yusuf 1. It was a disastrous defeat. No Muslim army would ever be able to invade the Iberian Peninsula again. In 1348, Abu Inan Faris succeeded his father and inherited Gibraltar. Interestingly he commissioned the great Berber scholar and traveller, Abu Abdullah Muhammad Ibn Battuta, better known as Ibn Battuta, to write an account of his travels. For some reason, Ibn Battuta never actually wrote the thing himself but dictated his story to the poet Ibn Juzayy al-Kalbi. While he was in Gibraltar, Battuta met a number of leading officials, such as the orator Abu Zacariya Yahya. He was put up by the local judge - or qadi - Isa'l Barbari who seems to have acted as his tourist guide while on the Rock. It is nevertheless extremely hard to separate Abu Inan from his father as to which of the two built what and where. Abu Inan - for all his affection for the place - probably only extended and improved upon his father's work - in particular the line wall that extended towards the south. But the man who created what still remains the outline of the older part of the town of Gibraltar - the Quasabah, Villa Vieja, Barcina and Turba - albeit using the original site blueprint set out by Abd-al Mu'min a couple of centuries earlier - was almost certainly the Marinid Sultan of Fez and ruler of Morocco, Abu Al'Hasan 'Ali ibn 'Othman - aka Abu-l-hasan.